Crescentia: C. cujete (calabash tree). ^ a b "PlantNET: NSW Flora Online: Glossary of Botanical Terms: C, Royal Botanic Garden Sydney, Australia". Retrieved 23 April 2018. ^ Jeremy M.B. Smith. "Tropical forest: Population and community development and structure: Relationships between the flora and fauna -- Encyclopædia Britannica". Retrieved 2008-03-07. ^ Govaerts, R. et al. (2018) "Theobroma cacao". Plants of the World online. Retrieved 22 April 2018. ^ a b Govaerts, R. et al. (2018) "Cola". Plants of the World online. Retrieved 22 April 2018. ^ "Crescentia cujete - the calabash tree". Tropilab. Inc. Retrieved 22 April 2018. ^ Govaerts, R. et al. (2018) "Circis siliquastrum". Plants of the World online. Retrieved 22 April 2018. ^ Govaerts, R. et al. (2018) "Dysoxylum parasiticum ". Plants of the World online. Retrieved 22 April 2018. ^ "Dysoxylom spectabile". NZflora. Retrieved 22 April 2018. ^ Govaerts, R. et al. (2018) "Pancovia ". 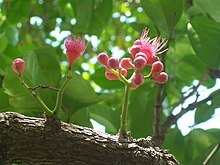 Plants of the World online. Retrieved 22 April 2018. ^ Govaerts, R. et al. (2018) "Pancovia golungensis ". Plants of the World online. Retrieved 22 April 2018. ^ Govaerts, R. et al. (2018) "Drypetes". Plants of the World online. Retrieved 22 April 2018. ^ a b c d e f g h i j (in French) Gereau, E. R., & Kenfack, D. (2000). Le genre Uvariopsis (Annonaceae) en Afrique tropicale, avec la description d’une espece nouvelle du Cameroun. Adansonia, 22(1), 39-43. ^ Ahmed, QamarUddin; Alhassan, AlhassanMuhammad (2016). "Averrhoa bilimbiLinn. : A review of its ethnomedicinal uses, phytochemistry, and pharmacology". Journal of Pharmacy and Bioallied Sciences. 8 (4): 265–271. doi:10.4103/0975-7406.199342. ISSN 0975-7406. PMC 5314823. PMID 28216948. Wikimedia Commons has media related to Cauliflory. Look up cauliflory in Wiktionary, the free dictionary. This page was last edited on 20 April 2019, at 10:33 (UTC).